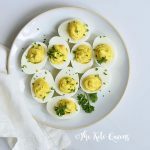 Instant Pot Deviled Eggs with Relish. Who knew making deviled eggs could be this easy? Serious though. Before making hard boiled eggs in the Instant Pot, I would literally lose half of the eggs in the shell. But by hard boiling the eggs in the Instant Pot, there's literally no egg waste. They come out completely whole and are so easy to peel! Place eggs on the trivet and place lid on the Instant Pot. Make sure that the seal is set to sealed. Hit Manual, high pressure and set time to 5 minutes. After the timer goes off, manually release the pressure. Be carefully when you do this because the steam is hot. Transfer the eggs to an ice bath and let sit for 5 minutes. After 5 minutes peel the eggs. Cut the eggs in half and scoop the yolks into a medium bowl. To the bowl with the yolks, add the mayo, relish, garlic powder, dried dill, salt, and black pepper. Use a handheld electric beater to mix until well-combined. Pipe or spoon the yolk mixture into the whites and garnish with fresh parsley or dill. Serve, or store in an airtight container in the fridge for up to 5 days. Can use pre-hard boiled eggs or cook eggs in the Instant Pot.